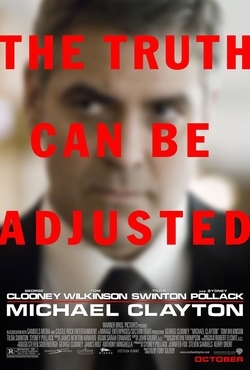 Michael Clayton (George Clooney) is world weary and slick. He fixes every lousy situation that comes up at his firm, but can’t muster the strength of will to fix his own broke down life. Interestingly, his home life is in about the same shape as his firm, but this is only revealed slowly over the course of the picture, by revealing how bad off the firm actually is (the poor state of Clayton’s home life is established early on). By the time you understand how bad off things are at the firm, Clayton has already begun to see the light with his family. But this change in Clayton isn’t obvious until the final scene: the last scene felt like a toss-up, whether Clayton was looking for a pay off, or following the redemption trajectory. For me, the ambiguousness at the end was the highlight of the entire picture. Clayton is thrust into one bleak situation after the next, always reacting with cynicism and aplomb, except where his family is concerned. About midway through the picture he starts to apply his “fixer” talents to his family situation, giving his ten-year-old boy an old fashioned man-to-man talk that I thought came off really well. The attempt on Clayton’s life forces him to reconsider his resentments toward his alcoholic brother, who wants to reconcile, but hasn’t been able to because Clayton has railed on him since the start of the picture. Although their reconciliation scene is brief, it’s enough. Clayton can’t afford to seethe at his alcoholic brother’s poor behavior, because he’s struggling with his own demons. But this only becomes apparent in the fallout with his police officer older brother, which especially conveyed Clayton’s own tenuous standing in the family. That’s what really impressed me about this picture: just as you feel you’re getting a sense for everyone’s role in the picture, you get more information which lets you reevaluate everyone in a new light. This kind of story telling enables the triumphant final scene, where you’re not really sure where Clayton is coming from. In the end he presumably destroys his creaky firm, but has shored up his family, making up with his siblings and reaching out to his son.